Search for unusual hen parties in London and you get a long list of strippers and party buses. However, a night sat in front of gyrating men isn’t for everyone. We’ve noticed a recent surge in people approaching us for the best workshops we have on our site that are suitable for hen parties. So, as helpful as we are we thought we would put together a list of the best workshops and classes we have that are perfect whatever sort of event you are looking for. Sometimes sticking with the norm isn't for everyone so for whatever reason you are looking for something a little different or quirky, we've got some brilliant ideas for you to sift through. Whether you want a creative alternative to willy straws or whether you want a booze-free, crafting affair. 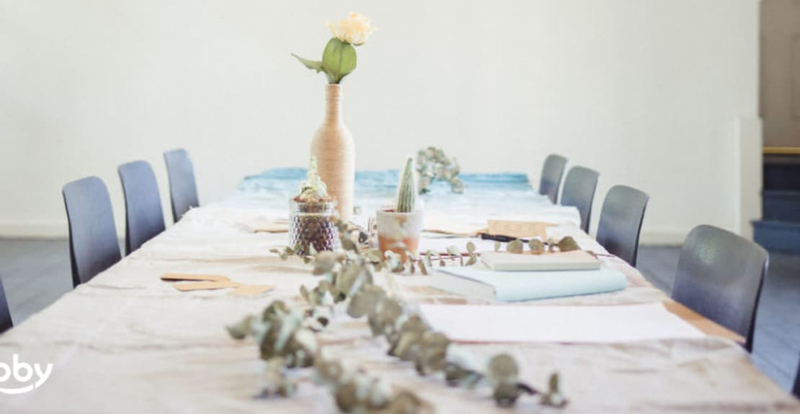 Most of our workshops and classes can be taught for groups as quirky hen parties, so if there is something on the site that takes your fancy, email hello@obby.co.uk, who can act as your personal hen party organiser. Here are some ideas, for inspiration. These feminist embroidery classes are perfect for the group that are focused on their suffragette routes. In this workshop, you are given a crash course on six of the world’s most well-known feminists, before outlining their faces and paying homage to them through the medium of embroidery. You probably won’t finish their faces in the class, but you’ll manage to complete Beyonce’s locks. You'll also have enough knowledge, thread and needles to find the rest of her when you get home. Maybe a good treat to cure the hangover the day after the big day? These classes can run for groups of up to 20, so no matter how big your hen party is, we can accommodate you rowdy lot with this cool class. The bride is about to have her hand laden with yet another ring to commemorate her man, so why not arrange for her to make a silver ring to commemorate her ladies. These silver ring workshops are for amateurs, because, well there aren’t many hen parties of professional jewellery designers we assume. Spend the day, melting down precious metal and shaping it into a design you'd be proud to rock on your hand. The finished product is classy, wearable and personalised. There’s something a little extra special about these silver rings, knowing you’ve crafted them yourself. Take it from us, this class is a show stopper. This Italian Cooking Class starts early on a Saturday morning but for nothing but great reasons. You start the day with a tour around Portobello Market in the picturesque Notting Hill. Charlotte and Claire, two sisters will teach you how to select the best quality ingredients in order to create dishes together. After choosing the best seasonal and fresh produce, you head back Claire and Charlotte’s beautiful airy home tucked away in Notting Hill before cooking up an absolute, Italian storm. Topped up with Prosecco as the days goes on, these cooking classes are relaxing and of the highest quality. Dinner with the girls, but with a do-it-yourself twist. So, unless you’re one of the lucky bridesmaids, everyone needs a hat for wedding day right? And for those of you that don’t, you’ll need one for the next wedding you go to. Wouldn’t it make total sense to make your own hat then? Katherine Elizabeth is a fantastic teacher, who teaches you how to make your own show-stopping designs. Suitable even for beginners, you won’t be disappointed with your creations. Have a look at the page to see what unusual and special designs other hen parties have created! These unusual hen parties run over two days in London, and Katherine does everything she can to make it a day you'll all remember.